Renting bicycles is easy in most big cities in Europe and around the world. Simply Google bicycle rentals and the name of the city. There are bicycle shops everywhere, many rent bicycles. They have special maps and guides. There are even organized tours for bike riders in places like Amsterdam and Munich, Germany. Again, to find out who has these, Google bicycle tours and the city or region of interest. In Europe, bicycles can also be rented at one train station and dropped off at another. Check the guidebooks and my page on Train Travel for details. Europe is physically small making it perfect for bicycle travel. Cities have parks and other places to ride. Campgrounds are bicycle friendly. They are located in or just outside the city limits. Ask the front desk for place renting bicycles. Most towns have parts of the road reserved for bicycles such as bicycle lanes. The Netherlands and Denmark even have separate bike trails altogether with their own traffic signals and pathways. There are bicycle trails in parks in cities and the nearby countryside. Many bike pathways follow alongside rivers like the Danube or the Rhine. The French countryside is full of bike trails. So are many other nations and regions in Europe. Many of the canals of England and the continent have bike and hiking paths that follow the waterway. Visitors with tents, RVs or canal boats use bicycles as a secondary form of transportation. It's great exercise, and once everything is setup for the night it allows one to travel without much effort. Visitors leave vehicles parked for days and even weeks, and still get to the grocery store. This saves big money. Europeans are particularly two-wheel crazy when it comes to bicycles. Every country seems to have its own major bicycle race, from Tour de France, Giro d'Italia and the Vuelta a España to single day "Classics" such as the Ronde van Vlaanderen and Milan-Sanremo. You can arrange your own bicycle trip and bring your own bicycle, if you wish. This can get pretty expensive and involves some effort to box and transport bicycles. Yet many bicyclists do just that. IBT - International Bicycling Tours. Bicycling World - World’s largest collection of cycling tours and biking trips. Bike Tours Direct in Europe - 200 Tours in 30 Countries. Bikely - Independent site that helps cyclists share knowledge of good bicycle routes. MapMyRide - MapMyRide users are able to visualize their health and fitness training progress through the use of maps, workout logs, fitness calculators/tools, and user-led community groups. 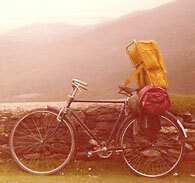 Shipping and Renting Bicycles - Air or Ship Travel with Bikes. Bicycle Rentals. Remember some countries drive on the left which can make things quite interesting. Be careful. I take a few days watching bicyclists and see how they cope with traffic, before I go to rent a bicycle myself. Triangular means warning. The symbol inside the triangle indicates what type of danger is faced. Circular means instructions, such as a red circle with a number is the speed limit. Square means information, such as city limit signs and parking. Color can also be important. Red usually means something is forbidden, such as No Passing. Blue usually means something must be obeyed such as Right Turn Only. White usually means this is information only such as distance to the next town. For more details go to my web page on International Traffic Signs. So be on the lookout for places renting bicycles. Ask around. It saves on travel time and is a great way to see the world. Great Bicycle Adventures Bicycling dos and don'ts plus stories from down the road. Cycling is an adventure, and it's easy. Stories and info about many Asian countries like Malaysia, China, Thailand, Myanmar, India and Nepal plus Europe. Tips on renting bicycles.